In the previous episode of this two part series “550 Simple Cabinet Construction Pt 1” we started the construction on a pair of overhead cabinets for a laundry room. 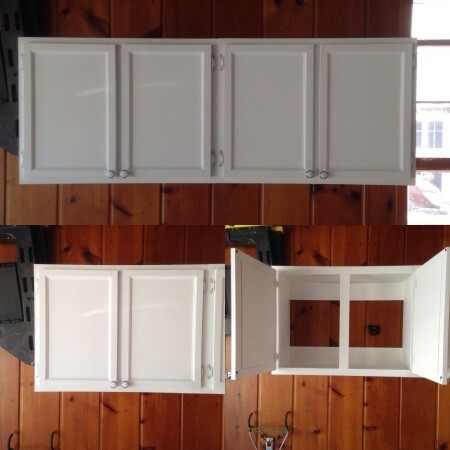 The cabinets are about as simple in design and construction as possible. A box with a face frame and a pair of full-overlay doors to enclose them. The only detail that could be remotely described as “ornate” is the ogee profile routed on the rail and stiles of the door frames. As far as I’m concerned the simpler the better when it comes to cabinet design. Why? For two reasons; 1) it makes construction a whole lot easier and more predictable, and 2) an entire wall filled with highly ornate cabinets would actually be it’s own kind of special craziness. Love the video. it couldn’t have come at a better time as I am getting ready to build a few upper cabinets for my shop. I also seen on Facebook where you are taking a new job and just wanted to say Congratulations! Keep the great content coming my friend. Great video! I love the tip on keeping the stiles long and trimming them with a crosscut sled. I never would have though of that. I probably would have spent 3 hours measuring and cutting and still ended up with inconsistencies! « One Rabbeting Bit to rule them all?